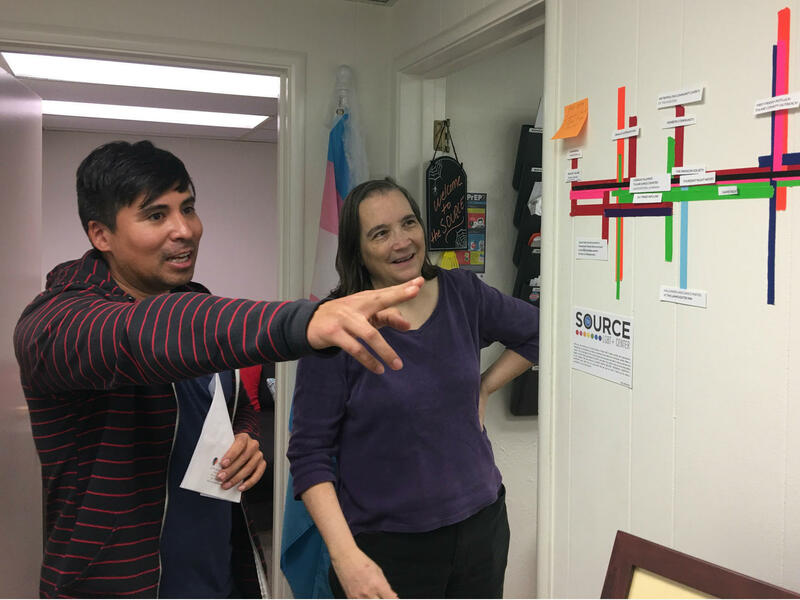 Nick Vargas talks with Dr. Kathryn Hall at The Source, an LGBT center in Visalia, Calif. Hall says that time and time again, her patients tell her they're afraid to come out to their other doctors. Alex Galvan remembers his last thought before coming out to his doctor earlier this year: "Oh gosh, here it goes." Vargas coached Galvan through his fear of coming out to his doctor and how to help educate the physician about treating a gay man. Finding the perfect doctor can be a feat for anyone. And a poll conducted by NPR, the Robert Wood Johnson Foundation and the Harvard T.H. Chan School of Public Health finds that 18 percent of all LGBTQ Americans refrain from seeing a physician for fear of discrimination. One of those people is 20-year-old Alex Galvan. The moment right before he told his doctor earlier this year that he is gay and sexually active felt like a nightmare. Galvan lives in rural Tulare County in California's Central Valley. He wanted to start a regimen of medication that helps prevent HIV infection, an approach called "pre-exposure prophylaxis," or PrEP. "Sitting in the waiting room was kind of like, 'you got this, you're just asking for a medication to help you,' " Galvan says, remembering what was going through his head before he came out to the doctor. "He's not going to flip out. And then the moment before was, 'Oh gosh, here it goes.' "
His doctor didn't know about PrEP, and Galvan thought he was going to be rejected. Instead, his physician educated himself. "I was kind of scared that he didn't know what it was, but I was also relieved because I let him do most of the research," Galvan says. "Yeah, and then I cried a little bit in the car, because I didn't know what just had happened and it all kind of blurred together." Pediatrician Kathryn Hall knows about these concerns all too well. She has been practicing medicine in Tulare County for over a decade, and time and time again, her patients tell her they're afraid to come out to their other doctors. A few years ago, she got so fed up that she surveyed more than 500 nearby doctors asking them basic questions about being welcoming. "I made the bar very, very low because we just didn't get much education on LGBT health in medical school," says Hall. "That is starting to change." Around 120 doctors responded to Hall's survey, and most of them said they would be happy to serve this group. Hall says there are lots of ways that doctors can make it clear they're accepting — a little rainbow flag on the door or taking out ad in a local magazine. "Many of the physicians that I know are LGBT-friendly, but patients don't know that and are very afraid that they're being judged," Hall says. A few years ago, Nick Vargas was having trouble finding an LGBTQ-friendly doctor in this agricultural region of California. He had just moved from the Bay Area to the town of Visalia, about an hour south of Fresno, where he leads a LGBT center, called The Source. He says he had to educate his new physician about how to treat a gay man. That led the 40-year-old to want to help others find doctors and get prescriptions for PrEP. "Once you tell them, they want to be able to help," Vargas says. "But they have to ask for it. And then they have to learn how to administer it, how to follow up, and that's a process and it's out of the scope of what they normally do." Vargas says he now has a great relationship with his doctor, but it took a year for him to get on the drug. Now part of his job at The Source is to refer people to LGBTQ-friendly physicians. People like Alex Galvan who was so nervous about coming out to his doctor. In fact, Vargas helped Galvan muster the courage to come out and ask for PrEP. Now Galvan has been on it for almost a year. "It allows me to have fun and to go out and enjoy myself," says Galvan. And more than that, coming out to his doctor is helping him take control of his life and health care. "All it takes is that is that little bit of a jump, and that little bit of a push to go, 'I need this,' " Galvan says. Galvan is now encouraging other friends in rural Tulare County to actively seek out a doctor who will care for all their health needs. Copyright 2017 Valley Public Radio. To see more, visit Valley Public Radio. A survey underlines how much discrimination can bend the lives of LGBTQ people. Their experience has taught many to stay away from doctors. That is one result of a poll from NPR, the Robert Wood Johnson Foundation and the Harvard T.H. Chan School of Public Health. This survey finds that 18 percent of Americans in this group, about 1 out of 5, avoid seeing a physician because they expect to be treated differently than others. Here's Valley Public Radio's Ezra David Romero. EZRA DAVID ROMERO, BYLINE: The moment right before 20-year-old Alex Galvan told his doctor that he's gay and sexually active felt like a nightmare. He lives in rural Tulare County in California's Central Valley. He wanted to get on PrEP, a CDC-recommended medication that helps prevent HIV. ALEX GALVAN: Sitting in the waiting room was a kind of a OK, you've got this. You're just asking for a medication to help you. He's not going to flip out. And then the moment before was a oh, gosh, here it goes. ROMERO: Galvan's doctor didn't know about PrEP, and he thought his doctor was going to reject him. But instead, his physician educated himself. GALVAN: I was kind of scared that he didn't know what it was, but I was also relieved because I let him do most of the research. Yeah. And then I cried a little bit in the car because I had no idea what just happened, and everything kind of blurred together. KATHRYN HALL: Pediatrics. This is Dr. Hall's office. How may I help you? ROMERO: Pediatrician Kathryn Hall knows about these concerns all too well. She's been practicing medicine in Tulare County for over a decade. And time and time again, her patients tell her they're afraid to come out to their doctors. A few years ago she got so fed up that she surveyed more than 500 nearby doctors, asking them basic questions about being welcoming. HALL: Hit the bar very, very low because we just didn't get much education in LGBT health in medical school. That is starting to change. ROMERO: Around 120 doctors responded to Hall's survey, and most of them said they'd be happy to serve this group. Hall says there are lots of ways doctors can make it clear they are accepting - a little rainbow flag on the door, or taking out an ad in a local magazine. HALL: Many of the physicians I know are LGBT-friendly, but patients don't know that and are very afraid that they're being judged. NICK VARGAS: Once you tell them, they want to be able to help. 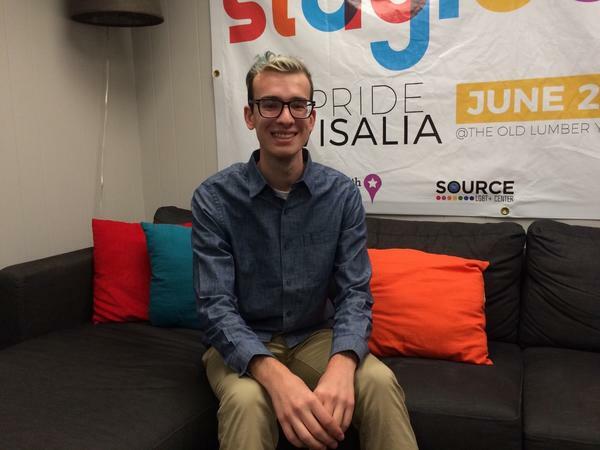 ROMERO: Nick Vargas leads an LGBT center called The Source in the town of Visalia, about an hour south of Fresno. A few years ago, he moved from the Bay Area to this agricultural region. He says he had to educate his new physician about how to treat a gay man. That led the 40-year-old to want to help others find doctors and get prescriptions like PrEP. VARGAS: But they have to ask for it, and then they have to learn how to administer it, how to follow up. And that's a process, and it's out of the scope of what they normally do. ROMERO: Vargas says he now has a great relationship with his doctor, but it took a year for him to get on the drug. 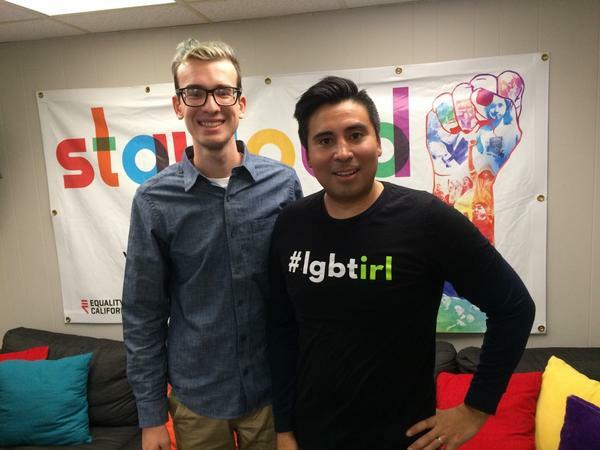 Now part of his job at The Source is to refer people to LGBTQ-friendly physicians, people like Alex Galvan, who was so nervous about coming out to his doctor. In fact, Vargas helped Galvan stir up the courage to come out and ask for PrEP. Now Galvan's been on it for almost a year. GALVAN: It allows me to have fun and go out and enjoy myself. ROMERO: And more than that, coming out to his doctor is helping him take control of his life and health care. GALVAN: All it takes is that little bit of a jump and that little bit of a push and go, hey, I need this. ROMERO: Galvan is now encouraging other friends of his in rural Tulare County to actively seek out a doctor who will care for all their health needs. For NPR News, I'm Ezra David Romero in Visalia. Transcript provided by NPR, Copyright NPR.